Location: Portumna, County Galway, Northern Ireland. Notes: Portumna Castle is a semi-fortified house in County Galway, Ireland. It was built at Portumna in the reign of James I, close to the shore of Lough Derg near where the River Shannon enters the lake. 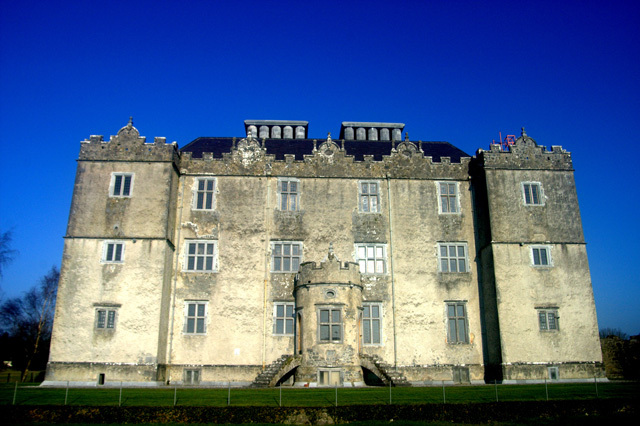 When it was built, Portumna Castle was without equal in Ireland at the time in style, grandeur and distinction, outshining castles at Rathfarnham, Kanturk, Carrickfergus, Charlemont and Burncourt. The elegance of Portumna castle can be attributed to the taste, experience and wealth of its builder, Richard Burke, 4th Earl of Clanricarde, Lord President of Connaught, of the famous de Burgo family of Norman descent. The castle was built around 1610 to 1618 at a cost of £10,000. The Earl also built a mansion, Somerhill House, Royal Tunbridge Wells in Kent. Portumna castle was one of the first, if not the first, building in Ireland built in the Renaissance style already common in Italy and France for over a century, but which took a long time to filter through to Ireland. The Renaissance features of the exterior are, strictly speaking, limited to the doorcase of the front entrance and the Tuscan gateway of the innermost courtyard, but the layout is an expression of Renaissance ideas. The castle is symmetrical in shape and consists of three stories over a basement with square corner projecting towers. The castle measures 29.7m by 21.2m and the corner towers are 6.5m square with gunports. A central corridor, 3m wide, runs longitudinally from top to bottom, supported by stone walls, which contain numerous recesses and fireplaces. The castle was abandoned as a home following a fire in 1826. The Office of Public Works has re-built the huge chimney stacks. The estate grounds contain walled gardens, gate lodges, gateposts, a yard.